A small scale family farm located in the Santa Ynez Valley. Marcie Jimenez was born in Santa Monica, California and grew up in Santa Monica Canyon with her parents and two brothers. The family were involved with horses and Marcie’s passion for horses and all things equestrian kept her busy throughout her childhood and high school years. She competed in horse shows, trail rides and endurance racing. Marcie came to the Santa Ynez Valley first during summers of her high school years spending time on horse farms and riding and training for shows and endurance. In 1976 her family bought the small farm where she still lives. The family kept a small herd of dairy sheep and goats and had originally intended to make cheese. After attending Cal Poly in San Luis Obispo with a major in Animal science, Marcie moved back to the Valley. She worked at the family farm with her parents and also operated the “GreekDeli” in Solvang. From the restaurant the idea for Marcie’s Pies was first conceived and pies were made and sold through out the southland from both the restaurant and to many prestigious stores including Lazy Acres Market, El Rancho Market, Jorgensen’s, and Trader Joes among others. The farm is where Marcie first met her husband Gustavo who was helping her father with the farming operations. They look forward to celebrating their 30th anniversary in August! Marcie and Gustavo’s two children, George and Christie grew up on the farm and attended Valley Schools. In 2001 Marcie and Gustavo purchased the family farm and began growing their specialty fruits and vegetables for farmer’s markets. Today the farming operation consists of over 25 acres with sales at up to 15 certified farmer’s markets a week. They are assisted in sales by their two grown children. And Marcie’s dad, George, can also be found at some of the markets proudly helping customers and bragging about his daughter’s pies! 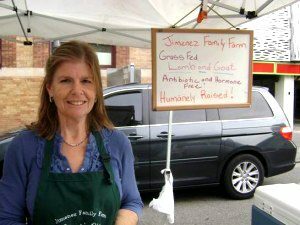 The array of products offered include beautiful and sustainably raised fruits and vegetables, handmade jams, preserves, farm raised pork, rabbit, quail and chicken and grass fed lamb and goat, and of course the famous handmade Marcie’s Pies. We hope you will watch and enjoy the video of our farm, courtesy of KCET.org.